Just like in 2013 and 2014, there continues to be no killings of Amur Falcons during the recently concluded season along the Doyang reservoir, Nagaland. And their numbers were at all time record levels. Over the years ownership in the community for falcon conservation has significantly gone up. The community-led Amur Falcon Roosting Areas Union (AFRAU), which setup check posts and carried out patrolling in 2014, have become a self-contained initiative with some external funding support from govt and NGOs. They create and lead events in the community related to the falcons. They keep up round the clock patrolling efforts during the season. A patrolling team belonging to the AFRAU. Finally, tourism is slowly emerging as a meaningful livelihood opportunity. This can make the conservation sustainable in an organic way rather than the (failed) attempts at compensation of non-hunting. If planned well, low-key ecotourism can provide livelihoods to ex-hunters. Ex-hunters can be guides, boatmen, homestay owners, cab drivers, etc. As we are already seeing in the last couple of years, it would not be difficult to attract domestic and global birdwatchers and wildlife photographers to come and watch this unparalleled spectacle of raptor congregations. Local Nagas and Indians visiting would help appreciate the phenomenon as well as cement their support of protecting the falcons. It would be commendable if global birding groups could plan to visit this region during this migratory season to show support for one of the greatest conservation turnarounds ever. Adding more momentum and solidarity to the conservation efforts, Union minister of state for environment, forest and climate change (MoEFCC), Mr. Prakash Javadekar visited the Doyang area on Nov 16th, 2015 to witness the falcon migration. Applauding the community conservation efforts, Javadekar announced that the central govt. will soon develop the Doyang reservoir as an ecotourism destination for birdwatchers and nature lovers across the world. “The world has recognized Pangti village as world’s Amur Falcon capital. More than one million birds can be seen in just 30 minutes. It is a very rare and exciting sight indeed”, Javadekar said. The union minister said the centre and state government would jointly work to promote infrastructure and eco-tourism in the entire Amur Falcon roosting areas in Nagaland. October 2015 will mark four years since the massacre of the falcons were discovered in Nagaland and published on Conservation India. It has been a wonderful turnaround since with all stakeholders joining hands and bringing the killings to an end. It has been an emotional journey for Nagaland to adopt the falcons as source of pride. This year, the local communities of Pangti, Sungro, Ashaa, Okhotso and Doyang villages, have taken the celebrations of the arrival of the Amur Falcons to the next level. 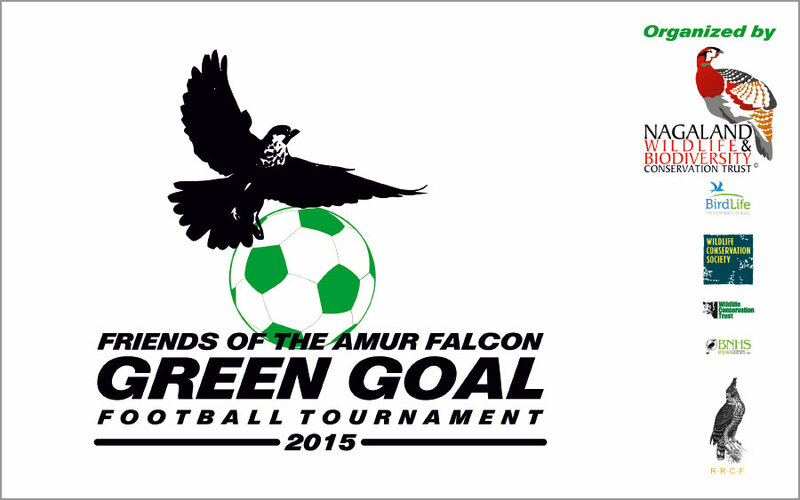 They have organised a 4-day “Green Goal” football tournament from the 20-24th October. The tournament will be held at the Sungro football grounds and eleven teams are expected to participate. The event will be kicked off by the Parliamentary Secretary, Youth Resources and Sports, Mr. Khriehu Liezietsu on the 20th. 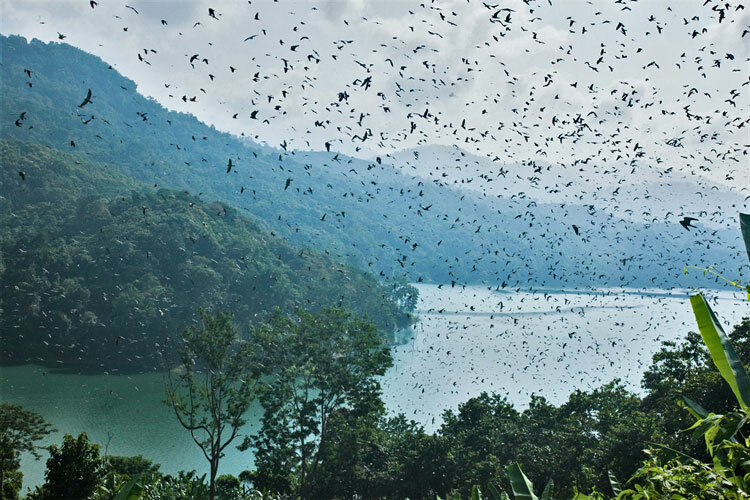 This year, as in 2013, the migration of the Amur Falcons continues in full swing along the Doyang reservoir, Nagaland. There continues to be no killings reported so far! The government, the forest department, local NGOs and, not the least, the local communities have extended their conservation efforts for the second year running to ensure there are no trapping of the birds. This season, the local community demonstrated more ownership by creating the Amur Falcon Roosting Areas Union (AFRAU), which setup check posts and carried out patrolling during the migratory season. 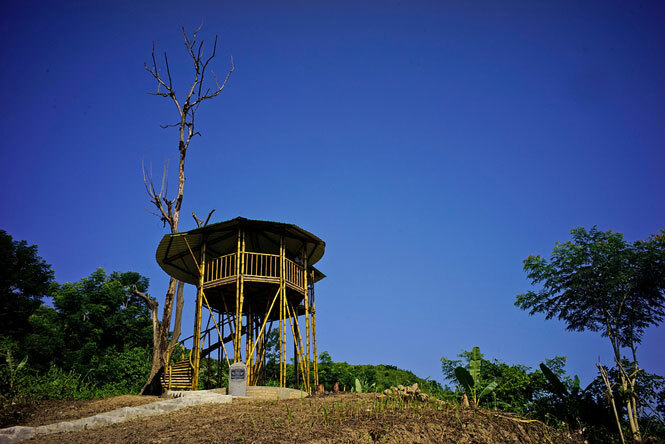 Earlier, the forest department along with the local community built a couple of watchtowers overlooking strategic parts of the Doyang reservior to offer great and uninterrupted views of the falcon congregations! Nagaland chief minister T.R. Zeliang who visited the area on Nov 9th said that the roosting area of the Amur Falcons had the potential to become one of the best tourist spots not only in Nagaland but also in the country. There has been initiatives to develop ecotourism in these villages to try and create a livelihood for erstwhile hunters. Several community members have created “homestays” to cater to the trickle of tourists, wildlife photographers and filmmakers who came visiting this season. This year, while Nagaland has put a firm end to the mass killings, there are reports of hunting from Umrangso, Assam and Tamenglong, Manipur. The Umrangso killings was reported last year and local NGOs have been working with the communities to stop the killings. The Manipur incidents was not known till this year. In both places efforts are underway with local NGOs, forest department and the army trying to control the hunting. Like in the case of Nagaland, it is likely that these killings have been going on for years with hunters capitalising on these mass stopovers during migration. Since traditional hunting and bushmeat consumption is rampant in these areas, nobody would have assumed a few dead falcons in markets as indicative of a “mass slaughter”. Given the heightened awareness of Amur Falcons in the last couple of years, the local media is taking lead now. But it shows that the problem is serious as it is widespread across the Northeast. An enormous effort is required at all roosting sites in the Northeast to stop the killings once and for all. It needs a lot of will and coordination between NGOs, local governments and the communities engaged in hunting. The annual Amur Falcon migratory season is just round the corner. 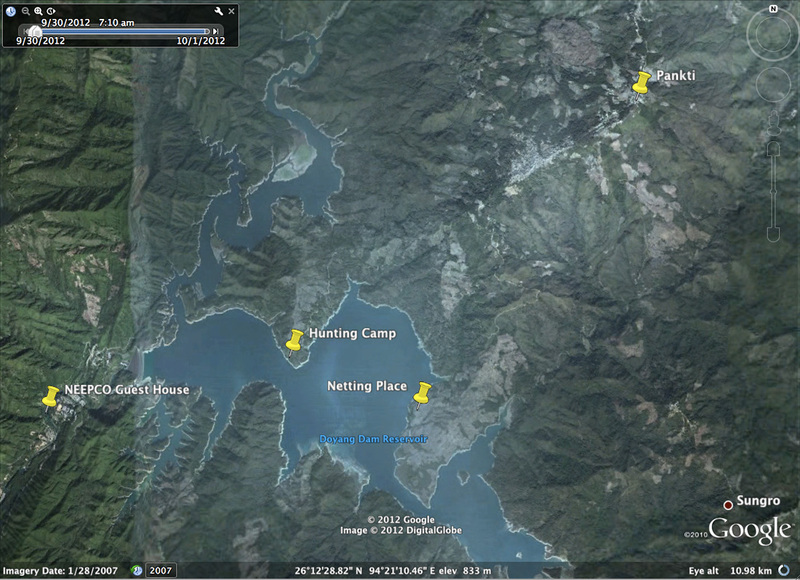 In less than a month we should start seeing the first of the falcons descend along the banks of the Doyang Reservoir. Conservation India will continue to report on the on-ground conservation programme that was fielded in 2012 after the killings were reported on these pages. Since then, the Amur Falcon has become the flagship of nature conservation in these areas. Members of the Doyang Ecoclub singing the ‘Amur Falcon’ song. 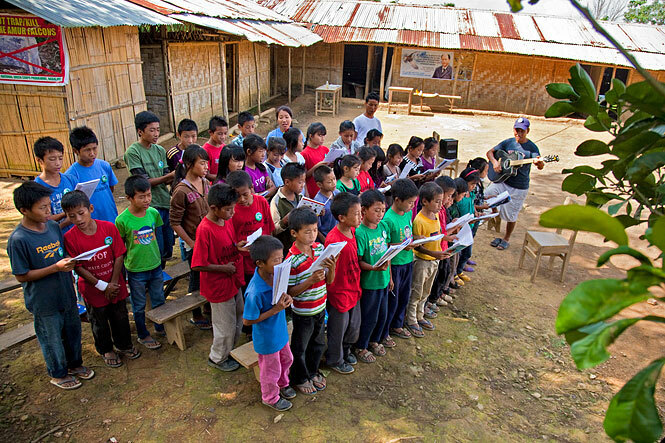 The Nagaland Wildlife & Biodiversity Conservation Trust (NWBCT), one of the NGOs spearheading the conservation activity, will expand its education programme and community outreach through their Ecoclubs targeting school children. It plans to add two more clubs this season. One of those clubs will target adults — hunters, students, Church leaders and village council members. These two additional clubs will enhance the reach of spreading the message of conservation within the community with its own people at the forefront. The passage migration of Amur Falcons through Nagaland is drawing to a close. The season lasted almost two months with the first birds arriving in early October. A big thank you and sincere congratulations to the Naga communities of Pangti, Sungro, Ashaa and Doyang villages who rose up to the occasion to provide safe passage to the falcons. Here is a delightful thank you message from Rohan Chakravarty! Nagaland Wildlife & Biodiversity Conservation Trust (NWBCT) just finished a volunteer-driven survey across a dozen locations in Northeast India, recording their numbers, routes, and roosts, as well as hunting pressures. Conservation India will publish a report on this shortly. Also, in a significant achievement, three Amur falcons were satellite tagged and released on Nov 6th 2013 in Pangti. The birds were named Naga, Wokha and Pangti. The three birds were fitted with satellite tags with antenna and solar panel weighing 5 gram on their back. The tagged birds’ migration can be monitored from this website. Male ‘Naga’ has Color Ring number KAM, Ring Number C56801; female ‘Wokha’ Color Ring Number KCM, Ring Number C56802 and another female ‘Pangti’ has Color Ring Number KFM, Ring Number C56803. All three birds have reached Africa. Click here to view their route. The satellite tagging was an initiative of the Union ministry of environment and forests (MoEF), Wildlife Institute of India (WII), Convention on Migratory Species Office (CMS), United Nations Environment Programme (UNEP) and the Nagaland forest department. The migration of the Amur Falcons continues in full swing in Doyang, Nagaland, and there continues to be no killings reported so far! 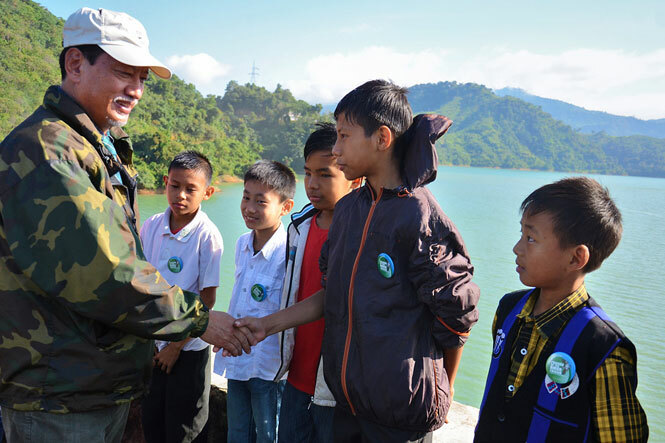 Chief Minister Mr. Neiphiu Rio interacting with Ecoclub members along the Doyang Reservoir. 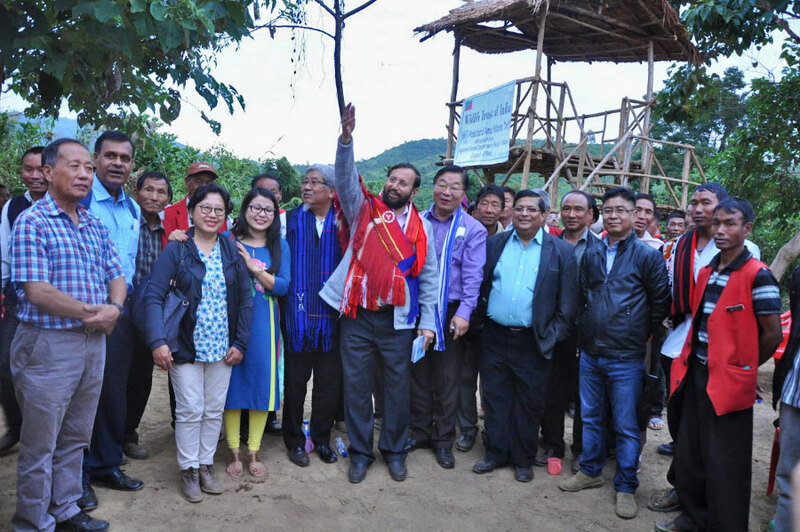 To extend his support to the ongoing conservation efforts and to witness first hand the Amur Falcon spectacle, the Nagaland Chief Minister Mr. Neiphiu Rio visited Doyang. On Sunday, the CM arrived with his wife as well as Minister for Environment and Forests Y Patton, Parliamentary Secretary for Animal Husbandry Yitachu, Parliamentary Secretary Labour and Employment Dr. Nicky Kire and several senior officers from the district administration, police and forest department. He personally witnessed the spectacle of migrating Amur Falcon congregations and was truly delighted. He photographed them for over two hours. He later addressed the assembled community members, thanked them for their spectacular conservation efforts and listened to Amur Falcon songs sung by our (NWBCT’s) ecoclub members! The CM was very supportive and repeatedly emphasized the importance of the ongoing education and awareness drives needed to sustain the outcome. Bano Haralu, who was an invitee to the event, was present with our full team (from Pangti, Sungro & Doyang) along with the children from the ecoclubs. The enclosed picture shows the Chief Minister interacting with the ‘Friends of the Amur Falcon’ ecoclub members in Doyang. Great news! The peak migration of Amur Falcons is on, and there have been absolutely no killings reported so far! 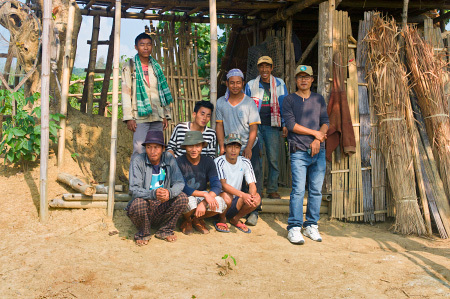 This remarkable outcome has been the result of a full year of painstaking effort from the Nagaland government (especially the forest department), NGO groups, and most importantly, the local communities who were determined to end the killings. Every morning, tens of thousands of falcons gather along the banks of the Doyang reservoir in a spectacle that is impossible to describe in words! These are probably the largest numbers of migratory raptors in the world (of one species!) and they climax in massive congregations along the reservoir. Before and after this ‘bottleneck’ the birds have never been seen in these mind-boggling numbers. Our team at Nagaland Wildlife & Biodiversity Conservation Trust (NWBCT) has set-up month-long Amur Falcon counts across the Northeast in over a dozen locations. Post Conservation India’s reporting of this incident, and the subsequent national and international outcry, a lot of on-ground conservation initiatives have been initiated in Nagaland. Principally, the Government of Nagaland, at every level, are fully committed to end the killings and have geared up to face this season. The Nagaland Wildlife & Biodiversity Conservation Trust (NWBCT), a Dimapur-based NGO, is leading a comprehensive programme with the support of the government as well as leading conservation NGOs. They have been in touch with various government officials as well as the community members since October last year on ways to stop the killings in 2013. They recently kicked off their ‘Friends of the Amur Falcon’ campaign with a conservation education programme covering the important villages in Wokha district. In a message of support, the Chief Minister of Nagaland Mr. Neiphiu Rio stated “The state government is committed to end the unfortunate killings of the migratory Amur Falcons in Nagaland while they are passing through the state. Further, Mr. Rio added, “It is our duty to protect the Amur Falcons and, in true Naga tradition of hospitality, treat them as honoured and esteemed guests”. In addition, other NGOs like Wildlife Trust of India (WTI) and Natural Nagas have also been been active in drawing up innovative initiatives to help prevent hunting of the falcons this year. Campaign Details: Shocking Amur Falcon Massacre in Nagaland! In October, huge numbers of Amur falcons arrive in northeast India from Siberia en route to their final destination — Somalia, Kenya and South Africa. This handsome little raptor has one of the longest migration routes of all birds, doing up to 22,000 km in a year. The birds are unusual in that they migrate a large distance over the sea and also continue their journey at night. In October this year, a group of us (Ramki Sreenivasan from Conservation India, Shashank Dalvi, Bano Haralu, Rokohebi Kuotsu) travelled to Doyang reservoir in Wokha district to check out information that thousands of falcons were being hunted annually on the banks of the Doyang reservoir during their passage through Wokha district, Nagaland. The trip confirmed our worst fears. Doyang is a rockfill dam and hydroelectric plant on the Doyang River, a tributary of Brahmaputra, 30 km from Wokha town in Nagaland run by the North Eastern Electric Power Corporation (NEEPCO). On Oct 21, as we were reaching Doyang reservoir at 0830hrs, we found two women walking along the road openly with about 60 skinned birds that turned out to be amurs. This was our first encounter with the species. We saw the dead birds even before we saw the live ones. Almost immediately, we saw thousands of amurs on the transmission lines along the mountain ridge. They seemed to travel overnight and reach Doyang during the early hours. They seemed to use these wires for resting and hawking insects. Amurs are known to be wholly insectivorous (Irwin 1981). Here we estimated ~6000 Amur Falcons at 0840hrs. This count was only from the wires visible to us, and the wires stretched for hundreds of meters in each direction (see attached slideshow). The next morning (Oct 22), at 0630hrs we counted ~12,000 birds on the same wires and ~23,000 birds flying above the Doyang reservoir. Later at 0830hrs the birds were seen using transmission lines. The numbers dropped considerably and by 1230hrs, very few falcons were seen on the wires. Over the course of the day, we observed 12 hunters on the main road carrying between 60-200 birds per head totaling over a 1000 dead birds carried to their homes or local markets and even door-to-door selling. The amurs spend the day on the transmission wires (almost entirely inaccessible to hunters) and descend to forested patches along the banks of the reservoir to roost (see map). The hunters ruthlessly exploit this particular behavior and set-up huge fishing nets (30-40m long, 10-12m tall) all over the roosting sites. We accompanied one hunting group (of 4 hunters) to the other side of reservoir by rowboat where we saw several other hunting groups. Hunting groups consisted mainly of four hunters; some parties had two. Birds get caught in the nets in large numbers. These birds get tangled in the nets while they come to roost during late evenings or when they leave the roost early in the morning. The nets were permanent and the hunters come every morning to remove the trapped birds. 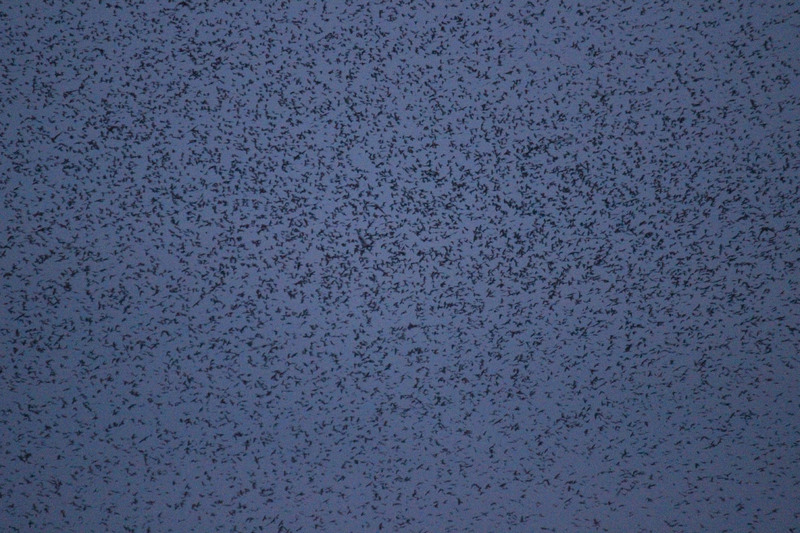 The nets were observed over the entire roosting area giving virtually no safe area for the birds. Branches and paths were cleared to set up the nets. Each hunting group had set-up at least 10 nets. On an average, 18 birds (18.30, n=23) were caught per net; hence each group catches about 180 birds per day. This was confirmed with interviews with hunters. We were also informed that about 60-70 hunting groups operate every day. This means during the peak migration about 12,000 to 14,000 birds are caught everyday. This obviously results in a loss of very significant number of birds from population everyday. This year hunters started netting on 19th Oct (interview with hunter) and the netting will apparently continue till the end of migration. According to hunters the peak migration lasts 2-weeks (our group will confirm this over the course of the next week or two, plus will study it next year). Assuming just 10-days of peak migration through Doyang, this suggests a shocking 120,000- 140,000 birds removed from the population every year, and more if the migration lasts longer or if there are more hunting sites in the area (neighboring villages, districts, etc.). This number doesn’t include birds potentially killed using guns, catapults, etc. — a widespread and accepted practice amongst Nagas. The captured birds are kept alive in mosquito nets or cane baskets near the nets so they can be exported alive to the customers and markets. From cane baskets, the birds are transferred to poles for ease of carrying into villages and towns. Birds eventually die in the process and these birds are de-feathered / plucked (like poultry) and smoked for sale (longer shelf life). Each bird is sold for a price between Rs. 16-25 (always sold as number of birds for Rs. 100 ($ 1.9 / £ 1.2). This sale usually happens door-to-door in Pangti village (where most hunters are from) as well as nearby Doyang and Wokha towns. Hunters (and sellers) know that Amur killing is illegal and banned by the Deputy Commissioner (Wokha district) since 2010 vide an issued order (Order no: JUDL-13/DR/2008-09/ Dated, Wokha, the 16th Nov. 2010). We also came to know about a few Amurs on the sale in open markets in Dimapur, in the plains far away. It is still a mystery where huge numbers of dead amurs go everyday, as the local villages cannot absorb such numbers for their consumption. One of the hunters told us that two pick-up trucks from Dimapur were to pick-up the birds from Pankgi village (we couldn’t confirm this and passed on the information to the District Commissioner and Superintendent of Police). It is critical to understand where the bulk of the birds go. By the end of the day, with the stench of smoked amurs in our heads, the scale and the ruthlessness of the massacre numbed us. The roosting place is localised (one specific bank of the reservoir) and can easily be sealed off by the authorities (Deputy Commissioner, Superintendent of Police, North Eastern Electric Power Corporation (NEEPCO) and Forest Department). Gain an understanding of and seal trade of amur meat mainly in big towns like Dimapur, Kohima. Aggressively follow-up on the enforcement of the DC’s ban with Forest Department, Police, local communities and the Church. Create awareness of the ban and the legal consequences (fine) in all villages including Pangti, Wokha, Doyang and Sungro. On the very same day as our verbal complaint (Oct 22nd), the dynamic Deputy Commissioner (DC) of Wokha district issued a fresh order against hunting of amur falcons (see new and earlier orders). This order was also carried in local newspapers. He also intimated the superintendent of police of Wokha about the killing and the potential trade in amur meat. He also alerted all community leaders in the area to enforce the ban. He set-up a meeting for our team member Bano Haralu to address the village leaders on 29th October 2012. The Divisional Forest Officer (DFO) of Wokha district Mr. Supongtakshi Aier and a district administrator addressed approximately 50 village heads, council members and student bodies of Pangti, Sungro and Akhotso villages in Pangti (since most hunters are from Pangti, the village closest to the Doyang reservoir). The government officials categorically stated that any ongoing trapping and killing of birds after the DC order was a violation of the law and it would not be accepted. The respective village representatives were asked to inform their communities about the order and that violators would be fined. Village heads have agreed to inform their communities about the status of the Amur Falcons and to spread the message of being “guardians” to the birds rather than being “destroyers”. However, they expressed helplessness to put a total stop to the killing if some measures are not put in place to replace the “economy”generated by the killing of the birds during this season. The govt. has to address this on priority before the next season. The Chief Wildlife Warden of Nagaland Mr. T. Lotha has issued instructions to his staff to seize all traps found in the area and has warned of stern action including arrests against offenders. Forest guards and personnel have been on duty since, and will remain till the end of the migration to monitor the situation. They have also begun to confiscate all live and dead birds caught by villagers. Live birds have been released and dead birds burnt. In some spots, nets put up by hunters have been removed. A more robust and proactive plan is being thought out to be effectively implemented next year in the month of September a month before the migration season. The issue has been brought to the notice of the Minister of Environment and Forests, Smt. Jayanthi Natarajan, following the meeting of the standing committee of the National Board for Wildlife (NBWL) on Oct 31st, 2012 in New Delhi. The director of BNHS and member of NBWL, Dr A R Rahmani has written to the Hon’ble Minister to request the Chief Minister of Nagaland as well as the forest department of the state to immediately stop the massacre, and draw-up a long term conservation action plan for the species. India has repeatedly pointed out that migratory birds are killed on their way to India in other countries — the primary reason why the Siberian Crane is now locally extinct in India. This incident goes to show that bloody, seasonal hunting sprees targeting migratory species is happening in India too, and we have to take immediate action to stop this. We will continue to update this page and send out emails to CI readers. The amazing saga of this Amur Falcon. Amur Falcon migration route finally plotted. It is extremely disappointing to see these magnificent birds coming from so far off places meeting such tragic end in the hands of a few greedy men. I think these people themselves also do not realize that, the gravity of the crime they are committing. May be because of their ignorance and more because of the callous attitude of the authorities. And We say “Athithi Devo Bhava” . Now this must stop and that to happen there needs to alternative mode of income generation for these class of people which would be more remunerative than hunting these falcons. I highly appreciate the efforts of the authors and team to bring this to light. Probably now this short video can be shown in some leading news channel to make the authorities both at the state and the center to take notice and more importantly act. I am thankful to CI team for this email and bringing up this matter to the national level. I would like to suggest everyone to please write to Wildlife Crime Control Bureau and bring it to their notice that this must be immedietly stopped. Unfortunately, I am unable to locate the WCCB nodal officer contact details in my contact list. But, if someone having that, please share it so that we can also build pressure on them for quick action. In my opinion it is must to urgently gain the confidence of local communities and the local FD and administration is the best to do this. I emailed Rina Mitra (the Addl directorate of WCCB) and brought this to her notice. This is not only shocking but sad and for country like india where guest is treated as god, now you know why there is no space for animals and birds in india. people in this country behave like animals. What is our minister doing is it not proof to catch offenders. low income or high is no way an escuse to break law. Only one remeade enforce law with iron hands. This is extremely sad news!! 🙁 The last i had heard of something like this was the capturing of Blue-tailed Bee-eaters from Karnataka. Now that your team(Im glad people like you all roam this earth) has these records, the government will take serious steps in ensuring this does not happen again. The Amur Falcon is a smallish dark sooty brown raptor with chestnut on the vent which sets it apart from the European Red-footed Falcon (Falco vespertinus), to which it is closely related and can easily be confused with. These Amur Falcons breed from eastern Siberia eastward through Amurland to Ussuriland and south through northern Mongolia and Manchuria to North Korea, northeastern China, and southern Japan. Using north-eastern India as their main flyway, these falcons winter in northern Botswana and Malawi , and south through South Africa. I have been interested in the Amur Falcon ever since 2008, when I was invited for an Amur Falcon conservation initiative in Nagaland, where 1000s of these magnificent falcons were being slaughtered for the pot each winter, but never made it. My March 2008 visit to Nameri Wildlife Sanctuary through which small flocks of these falcons are known to fly past, was five months too late to, even set my eyes on them. My recent meeting with Dr. Anwaruddin Choudhury, a leading authority on the birds of the northeast and a close friend, helped to put pieces in place on the plight of the large flights of Amur Falcons. The Habang area found within the remote district of Karbi Anglong, of Assam, and located close to the border of Nagaland’s Khasi and Jantia Hills, comprise a few small hamlets inhabited by Khasis, Nepalese and a few Karbis. Every winter, Amur Falcons are known to congregate in huge numbers and as many as 3000 birds have been sighted on a single night when they come to roost in the Habang area. It is not just Habang, two more areas, one each in Nagaland (Mokokchung district) and Manipur (Tamenglong district) play host to huge flocks of these birds as well. Every October and November, the villagers, both Khasis and Nepalese in Habang, eagerly wait for the arrival of Amurs to roost in their areas. Typically, these Amurs prefer to roost on vast bamboo thickets and perch on the emergent bamboo stems. The habangs build rough platforms – makeshift machans, close to the canopy of the bamboo clumps, by pulling together several bamboo stems and tying them with a rope. The whole village is known to engage themselves in this age-old ritual. Sitting on these machans, the habangs catch the Amurs with bare hands as they come to settle on the bamboos during dusk and sometimes through the night to grab the roosting birds and stuff them into gunnysacks. Each one would then descend down from the machans with bag full of Amurs. While most of the night’s capture is eaten, many of them are sold in urban areas such as Shillong. For over a month starting from mid October, an estimated 90,000 birds are known to pass through Habang area and many of them get slaughtered, never to fly any further on their long journey to South Africa. During the season, these falcons can be seen perched on powerlines like the swallows do, or in flight all over Umpanai, between Umpanai and Amsoi and also in other adjacent areas. From Habang, the Amurs are known to fly through Meghalaya – near to the border of Khasi and Janthia Hills – and towards the Sylhet plains of Bangaladesh. Many of the Amurs are also known to take a different route – through the Mokokchung and Wokha districts of Nagaland and Tamenglong district of Manipur and then to Bangaladesh through the Cachar plains of southern Assam. offering of meat in plenty. So much so that, some of the remains of the overkill are quite often thrown away to rot on garbage piles. This very thought is enough to mute you into silence and freeze your blood, and just to think that those images of the Amurs posted above were taken in relatively more happier times for the birds. This plight of the Amur flights in nothing less dramatic than the river crossing of the migrating Wildebeest across Masai Mara, where the Nile Crocodiles lie in wait for an opportunity of plenty. Source of info: Anwaruddin Choudhury. Choudhury, A. 2009. A Naturalist in Karbi Anglong. Gibbon Books, Guwahati, Assam, India. Nagaland , Shame on you. So sad, was shocked to see the staggering numbers of Amur falcons being killed everyday 🙁 . Nagaland Government has to take immediate action against this massacre and provide a safe passage for these magnificent raptors. I think only punishment to those people can stop all this thing. immediate action should be taken on them. someone should contact conservator who is on duty there. Thanks for the detailed coverage and follow up actions reported. CM Inglis in his 1911 Book, Birds of Southern India, records similar mass capture and sale of these birds in Andhra Pradesh. He called them Eastern Red-legged falcons, and mentions that because of their red-legs they were sold as ‘pigeons’.. Do these birds still migrate through Andhra or have they been extirpated there in the century since Englis reported similar slaughter? Your report is also an effective expose’ of not just this particular case if market friendly wildlife slaughter, but also of the great risk involved in relying on the much-hyped’traditional tolerance and reverence for nature’ as the sole conservation strategy.. I was in Nagaland for several years during the 1990s and I remember the markets in Mon district being flooded with live Amur falcons during the ‘season’. Though I inquired about the source of these birds or where they had been trapped, I never got a convincing reply. The sellers would keep them in woven bamboo cages, in twos or threes and even senior Govt. officials would buy them. Those days I was not aware of Amur falcons or its migratory stories, but it was disgusting to see people playing with the caged & helpless birds, as they aggressively defended themselves when being poked with sticks or fingers by perverted scoundrels. Besides the sheer number of birds being sold in the markets of Mon itself was intimidating, even to someone used to seeing all sorts of wildlife being dismembered, displayed or sold openly on the streets. Raj Phukan — Thanks! Please ping me with more information of Amur hunting / trade in Mon. The DFO Mon says that there isn’t hunting anymore in Mon but that was said of Wokha also (where this massacre has been reported from)! By next year, we need to ensure that all hunting locations are identified and patrolled. This is an appalling story and an embarrassment for India. The designer-rip-off uniform worn by the faceless bird-trapper also gives the lie to the notion that tribals must always be seen as a people apart. Deeply saddening. I was shocked to see the video itself, what could’ve gone through you all while seeing happening in front of you would’ve been so painful. I hope with your expose the government will put a stop to this. This is a mass massacre and like you have mentioned the killing is more than the capacity of those towns…it is commercial and not a sustainable tribal hunting! I CAN’T BELIEVE WHAT I SAW HOW UPSETTING THIS IS I HAD TO STOP WATCHING THIS VIDEO. IT MADE ME ANGRY AND SO UPSET HOW CAN THIS COUNTRY HOLD ITS HEAD UP HIGH. I WANTED TO GRAB THOSE PEOPLE AND HURT THEM SOOOOO MUCH BACAUSE OF THE WAY THEY WERE CATCHING AND SELLING THOSE FALCONS FOR FOOD. I HAVE BEEN AT A BIRD OF PREY ACADEMY FOR JUST OVER A MONTH AND LOVE EVEY MINUTE OF IT. I HOPE THESE PEOPLE GET PUNISHED FOR WHAT THEY HAVE DONE ITS WRONG ITS INHUMAIN AND NO ANIMAL SHOULD BE PUT THROUGH THIS. I HOPE THE GOVERMENT ARE GOING TO DO SOMETHING ABOUT THIS ASAP BEFORE MORE FALCONS ARE KILLED. ALL THEY ARE DOING IS MIGRATING AND STOPPING OFF FOR A REST THERE NOT HURTING ANYONE SO LEAVE THESES BEAUTIFUL FALCONS ALONE. It is shocking to know migrating birds are killed systematically in India. I request the concerned authorities in the government of India and the government of Nagaland to take stringent measures to stop the killings of these birds, and also request to punish the culprits. For us in Karnataka migration of birds is an occasion to celebrate, as if the daughter of the house is visiting. I hope good sense prevails in Nagaland. 1. highlight your concern as much as possible in print media (not electronics) as this would be the only way to reach these people(Nagaland Post & Morung Express are 2 widely circulated newspapers here). 2. where govt. failed Village coucils have suceeded. where village coucils dictates govt. relents. Involving village coucil is a must. In fact, couple of sorrounding villages and ranges have successfully implemented hunting prohibiton. whatever, let us protect this majestic global companion. Sorry but my english is not as goos as I like. Good work to report it. It’s a shame. The solution is, to take punitive measures that are proposed, but in turn, generate more benefits to the people, for alternative ways to the sale of these animals in the markets. It seems that not sure what the fate of most of them, and you say that the local population is unable to absorb such a large number of individuals. (Would not surprise me that traditional Chinese medicine, grant something magical to this hawks). Surely many people would pay to witness the migration of Amur Falcons in this venue. Would have to generate some kind of income that would generate ecotourism infrastructure in local populations. I hope this horrible hunting finish. Thank you. I think so it will be good, to do a campaign to gather signatures online for this. I have created a campaign to gather signatures for this. we are tour-operator in Germany working in sustainable tourism. We are rather well-known in Germany, because we have won 9 times the “Goldene Palme” Award from GEO Saison, the biggest German traveller magazine. We are operating several trips to your beautiful country. One of this trip is a birdwatchingtour to India, which is very succesful. Now, we got informations from several birdwatchers, that in Nagaland they don´t really care about rare birds. 120.000 – 140.000 of the rare Amur-Falcon are slaughtered every year. We want to ask you to do something against this bird-slaughter. It makes a very bad picture of Nagaland and India if you kill such beautiful and endangered birds. Here in Germany we have 400.000 of birdwatchers who will be informed about this massacre, soon. In UK there are much more than 1 Mio birdwatchers. Beleive me, this is a very negative picture of India. We have the first cancellations for our birdingtrip, because nobody wants to watch birds in a country with massacres like that. Please pass on the link and get people to sign the petition. I also needed the email address of the Ministry of environment and forests. to update it in my petition. It would be great if someone could provide this. Thank you for finding the facts and sharing with the world….Now let’s see how the Government plays its role..Don’t know whether the falcon population can take this massive blow with 120,000 -140,000 individuals slaughtered in such short time.Don’t really know how many more of them are surviving now.If this slaughter continues in the coming years also, the amur falcon may eventually come to the brink of extinction. Could not see the video, my eyes started watering. This may well be the worst crime ever committed on the avifaunua. Have never heard of crime in such a magnitude. Also India’s reputation has taken a serious beating. Thanks to these locals. It’s such a shame.. In Nagaland it very difficult to implemant the conservation laws. The local people have their own traditions and they do not care for central laws. Officials find it difficult even to enter the area. It necessary to study the situation at field level and explore how to proceed under prevailing law and order conditions. As far as I know the officers are well aware of the situation but prefer to keep quiet. My intention is not to discourage any effort in this direction but be careful and proceed cautiously. The local Naga communities have ensured safe passage for the falcons since 2013. Rajya Sabha TV [Video] Wide-scale killing of Migratory Amur Falcons in Nagaland is raising questions on India's commitment towards biodiversity. Royal Society for the Protection of Birds Amur Falcon Slaughter....time to speak up! 'Campaign Cartoon' -- Green Humour! Never Land in Nagaland!